NASCAR wanted a bitta hype for their Chase for the Cup playoffs this season, and damned if they didn't get it. All they needed was for the Charlotte Motor Speedway to go hybrid. Full marks for their trying something new, and it seemed like their devising a racetrack that's a cross between your basic vanilla speedway and a road course. 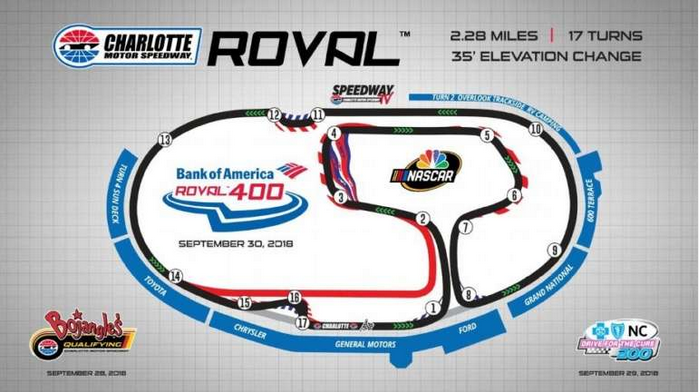 And we also discovered via the Bank of America Roval 400 that it's also part demolition derby. If this event wasn't gonna be sponsored by a bank, the next most logical option would be a body shop. Kinda looks like fun when you're the only ride on the track. Add a few other moving vehicles, though, and fun is where you find it. Amid the carnage were the Chase hopes of Jimmie Johnson, obviously. and Denny Hamlin as the Beaver. The four Chase favorites -- Martin Truex Jr, Kyle Busch, Kevin Harvick, and Brad Keselowski came through relatively unscathed and continue to have their sights set on the Homestead-Miami Speedway in November. No doubt they'll all be thankful there won't be any right turns between now and then.